Sad but yes, the wrestling mattress went in the trash last week. I almost cried. I even gave my dad sad puppy dog eyes. I thought I had him too and at the last second he rolled it up and out to the curb it went. The good news is (well for Sam & me, not sure for my Mom & Dad) that Wizzer came to live with us. He is a hyper pup. He dominates everything that moves. My dad calls him "Cohones". He is crazy but he listens good. He is always licking the inside of my ears. My Dad keeps them clean enough but then I have Wizzer sticking his tongue in there. My dad said Wizzer reminds him of one of his old girlfriends. Wizzer has never been to a vet before. He is going next week for a checkup, shots, & neutered. Boy is he in for a surprise! Sometimes Wizzer & I play "Lion Tamer". This is when Wizzer places his entire head in my mouth and I close down gently. It is so much fun. Shylow, we�re so happy that you have another new brother! We can�t wait to see a picture of your Lion Tamer game. Tell your dad to get that camera out. I have very sad news to share. Last summer, we lost both of our beautiful GRRI Goldens. Lexi starting having a problem with her right eye so we took her to the vet and she was diagnosed with a small, non cancerous growth above her eye. Surgery was recommended so we scheduled it. During her surgery a large, inoperable tumor was discovered behind her eye. Our vet called us and asked if we would like to put her to sleep then and there. We of course said no, we all wanted to say goodbye to her. The same day of Lexi's surgery, Killian had an appointment because he had lost some weight and wasn't as peppy as always. Long story short, he was diagnosed with lymphoma. We were just heartbroken. We were told Killian should have a good 6 months to live but were advised to put Lexi to sleep before her brain was affected and before she was in pain. So we set a date for Lexi. Then Killian just deteriorated so rapidly, I swear he knew she was going and just didn't want to be left behind. They were so attached to each other. We decided to put both of them to sleep together. It was such a sad day for our whole family and left a huge void in our hearts and our home. Adopting Lexi and Killian was one of the best things we have ever done. They were such a joy to be around and everyone that came to our house couldn't believe how sweet they were. We still miss them every day and I still find myself looking for them when I walk into the house. Our boys have been asking to get another dog and although Lexi and Killian can never be replaced, I think we are ready to welcome another addition into our home. Since adopting Lexi and Killian, we have moved to Yardley, Pa in Bucks County. I know the current adoption policy would exclude us due to our location but was wondering if exceptions are made for previous adopters. We had such a great experience adopting through GRRI and would love to do so again. If it isn't possible, I would appreciate any recommendations of other groups that might be able to help us. 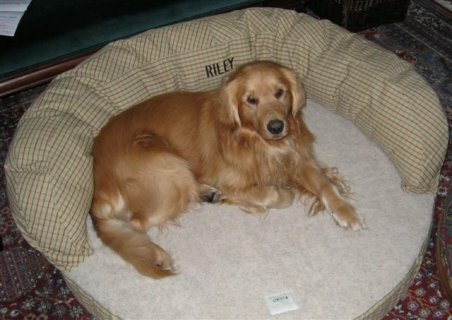 Jill, we can�t imagine the anguish that you all felt losing both of your beautiful Goldens. It seemed like only yesterday that you were adopting them from us. We�re so sorry for your loss. We�d love to help you find new Golden pals for your family. We loved the pictures. The "bunnies" are so cute!!! How many do you have right now? The "senior" dog, is he yours? Everyone is doing well. Maxx is enjoying running around the yard with Lucy especially now that the weather is breaking. I know I'm going to have a problem with him and my flowers. I had a really nice house plant that no longer has leaves around the lower half of it. I don't know why he likes to rip the plants apart. He's looking good. He just got groomed for Easter and looks so handsome. Anytime we can I would like to meet up with you if you go to a golden rescue event or maybe we can see you down your way just so we keep in contact with you. Thanks for the Nutro pet food update. I switched him to another dog food that is good for his hips. Hope you had a great Easter and we'll talk soon. Hi Julie, we�d love to see a new picture of Maxx all spiffed up for Easter. It sure sounds like Maxx is going to take over the job of the family gardener. Make sure you read the article on �Is Your Garden Good or Evil� in our spring 2007 newsletter. Hope you are well and enjoyed your holiday!!! We are all doing well. Haven�t taken pics yet, but wanted to keep you up to date on Cooper�s progress. I took him to our vet for a check up last night�..BOY�.he really is a handful in the car! Put him in the back seat of my bug and started to drive the 5 min. drive to the vet�s��had to pull over twice to put him BACK in the backseat after he climbed into the passenger seat while I was driving�.needless to say I swerved twice and finally got a grip on his collar which I held in back of me with one hand while driving with the other hand. All the while, yelling �Cooper! Lay down!� Get back there!� �Sit!� �Stay!� It was almost comical although I�m sure I looked like a crazy lady while driving. Needless to say, I am going to purchase a doggie seat harness for him ASAP and make sure someone comes with me so they can hold him in the backseat! So�..life is fun at the Sabanos house!!! Cooper is a riot and we are enjoying him immensely!!! I SWEAR I will send pics when we take them (hopefully Sunday). BTW�..saw the 2 pics and write-up in the newsletter! The kids got a kick out of it � thank you! We�re all laughing after reading your description of Cooper�s ride to the vet�s office. A harness and doggy seatbelt are definitely in order for him. You can purchase the seat belt from us through our online store! Boulder & I were wondering how you are doing? We talk about you often as his duck & bones you gave him are still his favorites! Boulder is doing very well. He is learning to get the paper w/o tearing it up which is huge for him. I'm also able to get some extra sleep in the a.m. when I tell him it's not time to get up, so go lie down. With that simple command, he turns in about 2-3 circles & lies back down. So smart! He is making a few friends, seems to really like yellow labs yet not so hip on other Goldens. I think he would really like to play w/ the deer, so if he could reframe from barking, I know they would come right up to us. He gets way too excited, like he's going to jump out of his skin, just more than he can stand. Of course a walk doesn't go by w/o a barrel roll or 2. Too funny for words. When we go away, I have people competing for dog sitting. They all think that Boulder likes them best. I love it and they love him!!! I know you were heading into surgery this month & we are hoping that that has possibly already happened & you are home & doing well. Forgive me, as once again I have misplaced your address. I have searched w/ no luck. We will anxiously await hearing from you. Hi Liz, Boulder is indeed a sweetheart and has that charismatic effect on everyone he meets. Judy has had her surgery and is doing well. She�s taken a hiatus from fostering until her knee is completely healed and functional. 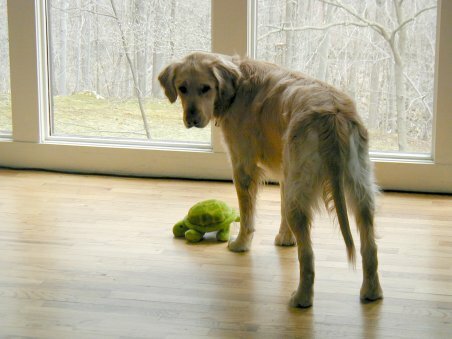 Based on some of the crazy Goldens she�s fostered, she does need to heal �or is it heel�.completely! First of all Honey is AWESOME!! She is just a wonderful dog; absolutely no problems. She is so sweet and just fits in perfectly here. Her and Max are getting along great. Max is such a great dog too so I think they are a perfect match. We have been letting them play because they play so nice. Unbelievable. Mike has been walking the two of them and I even walked both of them at the same time up to my daughter's bus stop and they were great!! I couldn't believe the other day when I took Honey with me to my daughter's dance class and about 8 girls came out to greet her...well she just laid on the ground and let them pet her. No jumping, nothing. She was as calm as could be. We feel totally blessed and we are so happy that we waited. It was well worth the wait and we thank you again for giving us a chance. We really appreciate it. When I get some pictures done of Max and Honey, I will pass them along. Shelly, we appreciate your patience in waiting for your perfect dog. We�re so happy that you�re pleased with Honey. She is a real sweetie and you are VERY fortunate to have been selected to adopt her! We�d love to see pictures. Max is doing well. He's really calmed down a lot, we are able to leave him out of the crate and he doesn't touch anything in the house. Of course we do gate off the upstairs and the den and laundry and powder room. He has barking interaction with the two dogs next door. He's great in the car and we both feel that we couldn't have gotten a better dog in a million years. It was so lucky for us to have crossed your path. We would like to take you up on a play date in the future since he loves other dogs. He even watches TV with us and when he sees a dog he becomes animated. I'm not sure you had mentioned a folder but I'll be watching out for it. Diana, we�re so happy YOU found US! We were really wondering WHO was going to be the right match for Max and then your application came along and we knew instantly it was perfect for him. Lynda�s furkids�and sons�.would probably love to see him again. My name is Maria and yesterday I gave up my Golden, Belmont. It was the most heartbreaking decision I have ever made in my life. My family has become very hectic with a 13 year old son involved in every activity you can think of and myself and my future husband working full time jobs. Our dog was the one suffering. He needed much more then we could provide, as in time and exercise. I contacted your agency on Thursday and by Saturday I heard from Pat. Pat was wonderful! She talked to me for 2 hours regarding my dog and our decision to part with him. Yesterday he was taken to his foster home. As gut wrenching it was to put him in someone else's car, it was also a very peaceful time for the dog and me. Your agency was absolutely wonderful in reassuring me that I was making the right decision. I could not have done this without the support of Golden Re-Triever Rescue. 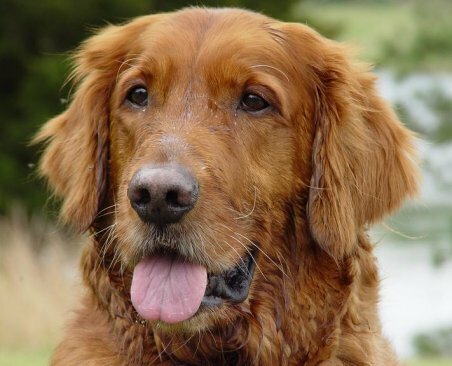 I did my research on your foundation, reading your website over and over, and just to see the pictures of how happy the Goldens were I knew that it was the perfect place for our family dog. Thank you so much for having this rescue foundation. You don't know how great it feels to know that Belmont will live a very long and happy life the way he was meant to. Thank you isn't even enough to say what the organization did for my family. You are truly wonderful people!!! Maria, Belmont is doing wonderfully. He�s such a character and we�re thoroughly enjoying hearing about his antics. We�re grateful that you entrusted us with finding him his new forever home. It has been a long time since I have brought you up to date on Smokey (12/05). He is 10 yrs. old now and we have had him for two years. Everyday has been a joy with him. He has settled in very well and even his sister has fun playing with him now. It took awhile but when he is not around, Mackenzie goes searching for him. Smokey had a bout with Giardia and lost 20 lbs. but has since gained most of it back. He also ended up with Anaplasmosis which I understand is a form of Lyme disease. After taking antibiotics, he is fine. As you can see by the picture, he loves swimming. I took me awhile to get him into the pool but once in, we have a hard time getting him out. 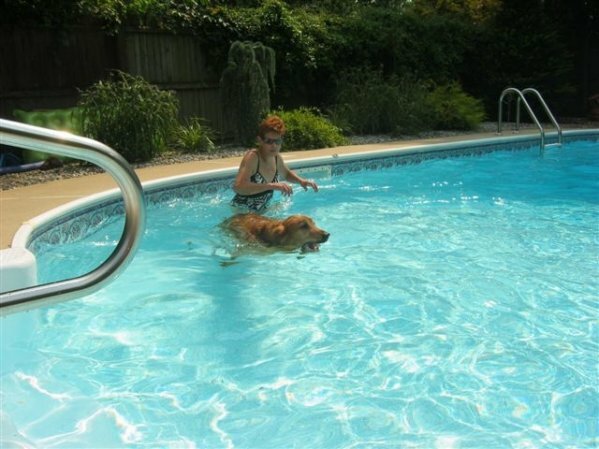 He is good though because he knows he can�t go into the pool without me. Our thanks to Myra and John, his foster parents, for doing such a great job with him and then giving him up to us. I will try to do better this year with sending some new pictures and hopefully we will be able to make it to the GRRI Picnic in September. Thanks for everything and keep up the great work you do! Hi Carlin, thanks so much for the Smokey update. It sounds like he had a rough time for a while but we�re glad he�s back on his feet and enjoying life again. Just wanted you to know how much we are enjoying Riley. He is such a terrific, sweet, well mannered dog. The four of us are crazy about him and our extended family enjoys him a lot as well. So glad you called OUR phone number. Hi Liza, excuse the pun, but Riley sure looks like he�s living the life of Reilly! He looks sooo happy in his new home. Thank you for all of your excellent work. We adopted Shockey (was Ace) several years ago. Also thanks to Eileen McFadden who recommended St. Hubert�s recently. Andy, we appreciated hearing from you and getting your updated address. We think very highly of St. Hubert�s Dog Training School and recommend it highly to our adopters who live in their vicinity. We�ve even had adopters travel over an hour just to take advantage of their positive reinforcement training methods and their one on one expertise. I received the newsletter today - Eileen, I saw that O'Hara has crossed over...he(?) looked like such a great dog, I'm so sorry for your loss. Things are still going fantastically well with Charlie. He and Bess curl up under the dining room table, one head or tail touching the other's... it's really so fortunate that they get along so well. They both know each other's names - "where's Bess" or "where's Charlie" get them in search mode. They're truly best friends at this point. Charlie is coming along very well in his training also - he's starting figure 8's (on lead) and heel, come, stay, down-stay all on lead with major distractions. I think soon he'll be on a light line (the step before off lead!). He definitely knows when he's "on command" and you can tell he's so proud of himself when he gets it right (big tail wags!). He is a dog that really enjoys being at "school"... when he works with the trainer he is such a "teacher's pet"! Charlie's training seems to have given Bess some additional motivation - I guess she doesn't want get left out of any action! Another REALLY good bit of news is that Charlie's eyes have been perfectly normal - we go to see Dr. Cho in about a month, but there have been no issues at all. I'm enclosing a couple of pics - enjoy! Have a happy and healthy spring! Way to go Charlie! What a wonderful update Helen. We�re so happy to hear how well he�s doing in school and thrilled that his eyes are back to normal. Please accept this donation on behalf of the memory of Jack Daniel Bausback. I hope this can go towards the many Goldens that have the potential to bring joy and love, just as Jack did for my brother & sister-in-law, Brian & Robin Bausback. He was truly a wonderful member of our family. Sandra, thank you for your donation in memory of Jack Daniel. Your donation has been placed in our Joann Smith Special Fund that is used to provide medical care for our Goldens requiring extensive medical care. By now you�ve probably already met your new �nephew�, Chase. He certainly won�t ever replace Jack but he will help bring love and laughter back into Robin and Brian�s home. And Ginger sure seems to love having a new playmate. I just wanted to inform you that I had to put Bailey to sleep last Saturday. The vet said she was in pain and could barely hear her heart. She was a wonderful dog. Dakota and I loved every minute of the seven years we had with her. She was about 14 years old and has taken very good care of us all those years. Ralph, we're terribly sorry to hear about Bailey's passing. It's always so hard to lose a wonderful friend. May wonderful memories of your seven years together bring you comfort. Just a little something to show my appreciation in helping Disney and I in our time of need. It was something that was unexpected but necessary, I felt, for Disney's well being. Disney has been a part of our lives for 12 years. She has brought us great joy and much love. It broke my heart to have to give her up. I still grieve the loss of her and wonder if she ever thinks of us. She is missed tremendously. But it does help to know that she is in good hands and is getting the medical treatment that she needs. Please give her a hug & kiss for me. Take care of my baby. I can not thank you enough for coming to her rescue. Thank you so much for your generosity and that of your family. Surrendering Disney to our care had to be heartbreaking for you. It was so apparent that she has been a very well loved member of your family � she�s a wonderful dog. She�s doing great in her foster home. She�s enjoying the companionship of the other dogs in the home and is being spoiled rotten. We promise that we�ll continue to take excellent care of her. We wish you the best of luck and hope that things work out for you. I just thought I would drop you a note to tell you how wonderful Maddie is. I take the opportunity to shout it from the rooftops whenever I can! She is so terrific. We are so perplexed as to her breed (she looks like a shepherd/pit bull mix but has webbed feet so she must have some retriever in her) that we did a DNA test on her. The results haven't come back yet, but she is a mystery that unravels everyday. She has all of these fur ridges all over her, a thick, wrinkly neck, almond shaped slanted eyes, small paws, but long thin legs. She is growing slowly but surely as the raw food slows down her growth. She was 11 lbs when we adopted her in the end of January and now is about 42 lbs. She is muscular and strong. I dragged out her shots, so I'm waiting to schedule her spay for mid-May since that will be a month from her rabies shot. My neighbor across the street adopted a 7 month old St. Bernard/Mastiff mix (they told her he was a boxer/lab mix!!!) named Bruno, and Maddie and Bruno roll around my fenced in yard all day. She is terrific with all dogs, yet a little afraid of certain people. We are meeting with a trainer tomorrow to see if I can get her to stop terrorizing my cats. I sent some pictures to Marcia Unger. Perhaps she'll post them (although Maddie would surely stand out among all the Goldens on the website!). We are so appreciative of GRRI for allowing us to adopt Maddie. So anytime you get discouraged or frustrated and think you're not making a difference or you're not appreciated, rest assured that you are! Terry, thanks for the update and the pictures! We�d love to hear the results of Maddie�s geneology testing. Her sister�s mom is also having it run. Please let us know how it comes out! We think that she�s definitely got Labrador Retriever in her and maybe some Ridgeback. Just a word of warm thanks for all your efforts on our behalf. This morning when I checked the GRRI-NJ website, I saw Belmont listed as "Adoption Pending" and was so delighted. My husband Ed and I will be meeting his foster Mom Linda this Saturday and hopefully will take him to his forever home this weekend. I don't have an e-mail address for Maureen who did our initial phone interview, or Julie-Ann who did our home visit, but please thank them for us. I did leave a phone message with Julie-Ann and hope to invite her over once Belmont settles in. We loved meeting her Abby and Molly. Linda has been exceptionally supportive and patient throughout this process, and we have the sense that we can call on her as we move forward with our first golden rescue experience. You all do terrific work, and we hope to become volunteers ourselves in the future. Eileen and Ed, congratulations on the newest member of your family. You all look soooo happy and we know Rory (formerly Belmont) is going to have a wonderful life with you. Hi Jo, we love updates like this, and laughed out loud about your �my house is full again with hair, dirt, chaos�� sentence. How true it is. I was going to call you this weekend, but you know time just flies by. Maggie is doing good, we nicked named her "Ms. Barks A-lot". She has such personality. Of course she has picked up my other dogs bad habits, such as expecting a biscuit every time she comes back in. She also sleeps on our bed at night. I can thank Jim for that. I bought her a new dog bed but I guess she likes ours better. Hi Karen, thanks for your Maggie update. We have to side with Jim, we love having a Golden Retriever sharing our bed at night! You have so been on my mind!! I have asked Kathryn to take some pictures of Daisy to send you - hopefully by Mothers' Day...:). Daisy is doing GREAT!! She loves us and the waggy tail and kisses are most welcome! And we love her!! She has adjusted wonderfully and is getting better and better at meeting our extended family and friends including our four-legged ones!! Daisy does walk very fast and that is terrific; she still pulls at the leash and I am amazed at how strong she is! She has nearly yanked me off my feet once or twice when she has spotted a bunny on our walk before bed and I wasn't paying attention. She is very polite and patient with us and I am learning her signals. Daisy is a sweet and lovely addition to our family. My apologies for not keeping in touch better; I have had a very busy 5 weeks. Anyway, it is nice to hear from you. I will be getting photos of Daisy to you ASAP and thank you again for all of the wonderful work that you do. Thanks for the pictures Rosemary. Daisy looks wonderful! 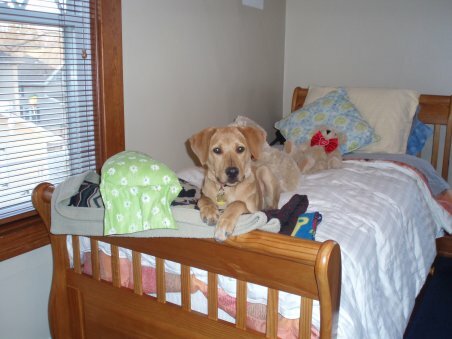 We love this shot of her laying on HER bed. We had Val's "DNA" tested. I am attaching the results as well as her spay certificate. We are in week 6 of training - she is VERY smart and doing well. She understands what you want her to do but has a mind of her own. I will send pictures soon. I would be interested in the results of her sister. We used wisdom panel to do the test. Thanks for sending Valarie�s DNA results Jan. It was quite interesting to read about the genetic mix in her lineage! We�ll forward you her sister�s results when they get them. We�d love to see new pictures. I had a problem with my computer so I couldn't get any e-mail, but I have never had such a wonderful dog in my life! Everyday is better and better .He is such a perfect match for me and Louis, I thank you every day. I take him every day for long walks which he loves. He seems to know most of the commands at dog school and is a perfect student there, but he knows how to get over me. I bought an easy walk leash but he figured it out so he takes the leash in his mouth to walk me. He is wonderful socially and plays well with all the dogs at Thompson park, I would still be interested in any play dates or your offer to take him for a weekend if I need to go away, I have a new family of teenage boys who walk him Monday, Tuesday and Wednesday when I'm at work and it really makes a difference since they play ball with him and he loves the teenagers. He's so much calmer on those days. On my days off he is great even if I'm gone for three or four hours. Happy Mothers Day to you and your family of children and dogs. I always show the pictures of all the Neff bunnies and people are amazed at how you got them all to sit at once. Thanks again and keep in touch. 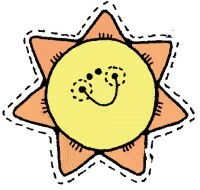 Diana, we were thrilled to hear how happy you are with Max and how well he�s doing in school! Donna, our thanks once again for remembering one of our furkids with a generous donation to rescue. Drew and I miss O�Hara and Jessie terribly but we wouldn�t have had the joy and love we shared with both of them if it weren�t for GRRI. Your donation will help us to continue to give that special bond to our adopters. Thought you would get a kick out of this picture I took of Kai today. My mom and I took a 45 minute ride to a park in NJ. We met up with 2 other people that I met on a GR Forum and their dogs. We took a nice walk in the park that borders a reservoir. It was so pretty and scenic and the dogs were happy that we let them take a quick dip in the water. Kai always reminds me of a "tomboy" if that's possible in a canine LOL! She is always wet, dirty and stinky from having so much fun. Here is a photo I took of her today right at the end of our walk. This is a great picture of Kai, Jeanne. She sure is having a great time! We loved the Mother�s Day card; thanks! 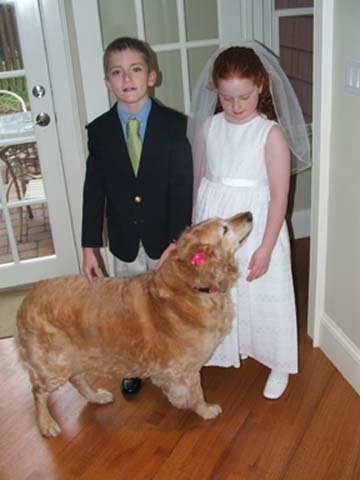 Here is a pix of Kelly and the kids at the First Communion. She was at Verona Park today trying to catch geese and squirrels. You will see Clare and Eamon�s cousins in some of the pix. 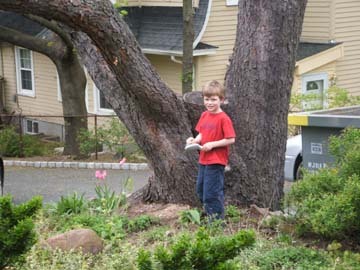 The little boy in the red shirt, John Patrick, is taking Kelly�s hair and putting it in the cherry tree so the birds can use it in their nests. The pictures are wonderful Sarah. That�s so sweet that John Patrick is helping to warm the bird nests by putting her fur into the trees. We have quite a few volunteers who also put their dog�s fur out for birds to use. Thank you so much for the Mother's Day card. I've been meaning to write to you since mid-April when we celebrated our 1 year anniversary with Roxy, but I wanted to send pictures too and hadn't figured out the new camera and how to upload the pics to the computer. Now I've done that and I've attached several pictures for you of our beautiful, wonderful, loving, calm sweetheart named Roxy. Yup!! Never thought I'd use all those words in the same sentence to describe our Roxy, but she's surprised us all. You would never know she's the same pup you waved goodbye to a year ago. She is quite the character and has such a goofy personality - - she makes us laugh every single day. The facial expressions are simply priceless! Roxy came to us with many bad habits as you very well know, and she's forgotten all of them. You can see from the pictures that I did give up on trying to keep her off the furniture, but I'm glad I did because she sits right there beside me every evening, with her head on my lap and she is such a love bug. She certainly wears her heart on her sleeve, and there's never a doubt that she adores us and her forever home. 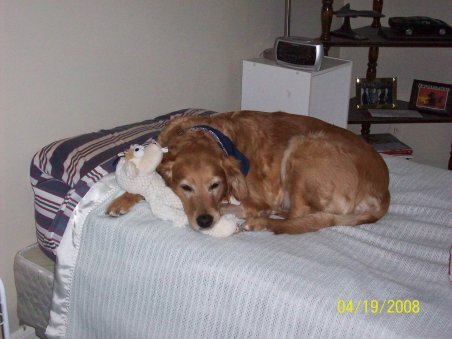 We agree, Brenda, a cuddly Golden Retriever to snuggle with at night can�t be beat! Happy Mother�s Day from Belmont who sends his love!! It doesn�t seem possible that we enjoyed your hospitality a week ago and that we came home with an absolute treasure. We are particularly grateful for the loving care you showed him as his foster Mom during the month he spent with you and for choosing us as his forever family. He has brought us more joy and laughter in the past week than I can adequately describe. We have golden sunshine back in our lives, and we find it difficult to imagine that anyone could ever have parted with him. However, if it is within the protocols observed by GRRI-NJ, please let those who surrendered him know that we respect and appreciate the decision they made. We cherish him already and will do our very best to meet his needs. As I mentioned on the phone, we changed Belmont�s name to Rory. It�s an anglicized version of a name in Old Irish that means �red king.� On his arrival, he inspected the house with great curiosity, found his toy box and food and water dishes in the kitchen, and discovered that he is allowed on the living room sofa where he can survey his new domain and look out on the goings-on in the neighborhood. Within a few minutes, the first floor resembled a full-fledged toy bazaar, much to our delight. We know he senses the presence of our previous Golden, Kitt, and we told him that she would be a guardian angel for him. He seems just fine with the arrangement. He is settling into a routine that reminds us of her at times and also enjoys waiting at the front door each evening for Ed. Rory announced his presence in the backyard in Mt. Vernon by putting the local squirrels on notice that order needed to be restored post haste. With lighting speed and agility, he virtually launched himself off the back terrace and gave a few of them heart failure as they scurried for the trees and fence. This week, we also walked around the neighborhood every day so he gets a sense of his new location. Many of our neighbors know how much we missed Kitt and have been very welcoming of the new addition to the family. He does adore people, as you suggested, and seems generally pleased with the attention. He greets women more readily than men when we�re out walking but will go to them with a little gentle coaxing. On Monday, Chris Brown, our dog walker, arrived to meet Rory, and I drove him over to the nearby dog field where he met the play group of which he now a member in good standing. I am attaching pictures of Bailey who lives on our street, of Hurricane and Ashton who are Katrina rescues, and of Mr. Higgins whom Chris has been caring for for eight years. We did this for two days, and on Wednesday, Rory went home in Chris�s car. On Thursday, he was picked up and came home with his friends. The interaction Chris and I observed was positive. The only major issue we have to be concerned about is Rory�s need to be on leash until he is on reliable voice recall. Hurricane is possessive of her tennis ball, so Chris will have to make sure that she and Rory have their own balls. Other than that, Rory�s routine will be in place when I have to go back to work tomorrow. I am not looking forward to leaving him, but I think he will adjust quite well to a consistent schedule and structure. I will keep you posted. We had our first wellness visit with our primary veterinarian, Dr. Anthony Meglino in Tuckahoe so Rory could get acquainted with him and his staff without the stress of any procedures. Rory was very well behaved and everyone congratulated us on his good health and appealing looks and temperament. Apparently, some rescues do not get off to nearly as good a start, so many thanks to GRRI-NJ for your thoroughness and expertise in assessing any health concerns prior to adoption. On the whole, Rory has been very well behaved and just seems to enjoy being part of whatever activities are going on around him. He loves to run errands with me in the car, so we�ve been out about town everyday, post office, bank, cleaners, Petco, etc. and the socialization has been good for him. He was less at ease the day we walked around Bronxville village, so we�ll take that at a more leisurely pace. On his new blue collar, he now has a name tag with his phone numbers, his official NY license, his GRRI tag, and his microchip tag. We also had our first obedience class, and he was fine. The instructor was impressed that he took things in stride, and we�ll continue to work on the basics every Thursday evening for eight weeks. I am guessing that he would be terrific at agility and may pursue it with him once I get a better read. Rory is a very intelligent, extraordinarily affectionate, sweet dog. I laugh when I think that I asked you if he was an �alpha in waiting.� He just craves physical contact and almost immediately lies down to get his tummy rubbed. And yes, beyond those soulful brown eyes is a bit of a wily, endearing con artist who is VERY FAST!! I have been �surfed� twice when I unthinkingly left the margarine tub on the kitchen table before dinner. Rory got a good lick or two before I caught him, but no harm done. As you told us, he does not beg at the table, and that is wonderful. Food has not been a problem, and I discovered that he likes little baby carrots as treats, as well as his Buddy Biscuits. If there are other treats that he enjoyed at your home, please let me know. I think you mentioned plain frozen yogurt, but I�m not sure if you stuffed a bone with it or how you prepared it. Ed took Friday off, so we decided to spend a long weekend at the house in Quogue. Once again, Rory investigated all the nooks and crannies and somehow managed to find Kitt�s toy basket tucked away in the back of the closet in the master bedroom. He pulled out toys, one by one, and couldn�t decide which one to play with next. He also spent a great deal of time exploring the fenced-in area around the pool and seems so wonderfully happy to have the freedom to roam safely. He seems to be calmer and less anxious each day as he settles into a routine. We do have to watch him closely coming and going from the house as any open door is an irresistible invitation to him. This could well stem from the limited circumstances in which he lived with his original family or with uncertainty about his forever home. What concerns us most is that with his lightning speed and athleticism he could �escape� and get away from us without an understanding of the dangers of an unfamiliar setting or of local traffic. Any thoughts or suggestions you have in this regard would be most welcome. I wonder if this may be a phenomenon common to newly adopted rescues. Yesterday, we went to the beach for the first time, and the extend-a-leash provided a bit of room to explore yet kept him safe in a new environment. He absolutely loved the wind and sand and incoming surf and new scents. We don�t know if Rory had ever been to a beach before but imagine that he will come to love it as we do. Today, I think Ed is also going to open the pool for the season, and we have no doubt that Rory will have a great time once we clean and condition the water. I�ll take pictures and forward to you. In closing, I hope you�ll excuse this somewhat rambling letter. We had to get a lot done this week so Rory would feel really at home before I go back to work (darn! ), and I wanted to reassure you that he is in responsible, caring hands and is adjusting well. Our sincere thanks to you, Linda, for all your love and hard work and devotion. This has been a very positive experience for us, and perhaps we can become involved over time to make it possible for others to know the rewards of adopting a golden rescue dog. As your time allows, please let us know how your golden family is doing, especially Guinness. If there are GRRI-NJ events that we might attend, we�d like to meet some of the folks we�ve been in contact with over the past few weeks to express our appreciation and to show off the new member of the family. Rory is definitely home. Eileen, thanks for such a positive update on Rory. We agree, Linda did a wonderful job with him and we thought you two would be the perfect home for him. We were obviously right! Lexie is still doing great! She absolutely adores the boys. You were so right to place her in a home with kids! She looks all sad when they leave for school and when they get home, she jumps into their laps. She has met a few of the neighborhood dogs and did really well with them. She is just a doll! Anyway, just wanted to give you a little update. Aw�.we�re so happy to hear that Lexie is taking such great care of �her kids�. She�s got a very maternal instinct and we thought she�d love to be surrounded by children. We�d love to see some pictures of them together. We are making this donation in memory of �Duke� who died tragically while undergoing a minor procedure. Duke was the beloved pet of the Martinez family. Thank you so much for your donation Karen. We�re sorry to hear of Duke�s passing and will express our condolences to the Martinez family as well as notify them of your donation to us. I reached out to your rescue group on behalf of a friend who thought she may have to surrender her Golden puppy. I had the pleasure of speaking to Pat (DeSarno) on Friday at length about your group. Being an animal lover and having rescued my 3 Pugs, I was moved to donate. In short, I really like you guys! I particularly like the fact that you rescue puppy mill females. 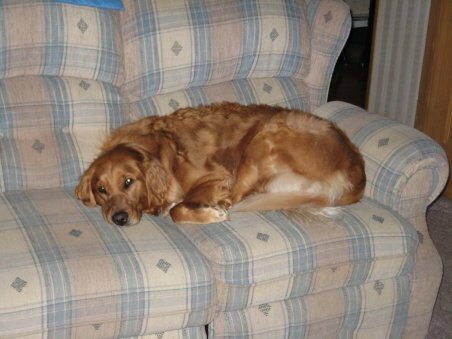 One of my favorite dogs in the world was Precious, a Golden rescue, so please consider it a donation from her. Thank you for all the work you do on behalf of dogs! Veronica, thank you so much for your generous donation on behalf of Precious! We�re all keeping your friend�s puppy in our thoughts and prayers.